From There to Here and Beyond. A brief history. | Great Escape. Nick Bullock. In 1987 Nick Bullock joined the Prison Service as a Prison Officer. Four and a half years later he qualified as a Physical Education Instructor and left behind the fighting, the dirty protests and savagery of a punishment block in a maximum-security gaol. As part of the twelve month P.E. training course, the three weeks spent at Plas y Brenan, the National Mountain Centre in North Wales made the biggest impact. The evening lecture from Nick Banks titled North Faces showed Ice-encrusted freezing cold bivy’s, deprivation and suffering. Shock and the shaking of heads in disbelief stemmed from all but one of the aspirant P.E. Instructors. Nick Bullock sat smiling and warm inside knowing he was watching the path his life would now follow. Twelve-years later with the aid of manic fitness training, several operations-smashed bones-cortisone injections and the strongest anti-inflammatory pills on the market, Bullock escaped the clutches of the prison. Leaving behind the security of a wage at the end of each month, a pension, a home, routine and stability and embarked on a life of insecurity, sofa’s, floors and full time climbing. During the twelve years of full time employment as a P.E. Instructor he endeavoured to use his time-off work to the full, and has thrown himself into (and often down) some of the hardest rock climbs, ice climbs and mountains in the world. His climbing has taken him to countries such as Canada, Australia and North America. He has attempted and successfully climbed new routes in India, Pakistan and Nepal. Peru has been a forcing ground with five trips on successive years, giving thirteen summits, four new routes, including Fear and Loathing on Jirishanca’s Southeast Face ED3 in the remote Huayhuash region. The Central Pillar Direct on Quitaraju’s South Face ED2, and a heavily sedated direct finish-solo of the Dawson/Cheesmond line on Ulta ED1. The European Alps in winter have also been a successful forcing ground for many hard classics-solo’s and new routes such as Lost in the Dark ED1 on the Grande Pillar and Borderline ED3 on The Sans Nom, both in the company of Jules Cartwright. Most recently the first free ascent and the third overall ascent with Stu McAleese of Patrick Gabarrou’s Omega (A2/3 originally) on the Petites Jorasses gave thirteen pitches of hard technical climbing to a grade of Scottish V111/8 and possibly one of the hardest free routes in the French Alps. The ascent was delayed having been choppered off the previous year with a broken ankle. On holiday from the cold stuff, (summer 05), a return to fitness on the rock saw him cautiously-creeping through the sea moss, watched by Grey Seals and dive-bombed by Guillemots while successfully laying E7 ghosts to rest on North Stack Wall at Gogarth in North Wales. The Bells the bells and The Hollow Man were both bagged leaving two more of the big scary E7s to be climbed for the set. A solo of Right Wall on Dynas Cromlech was also a highlight. It is now November 07. North Stack Wall at Gogarth quietly calls. The Clown climbed on-sight, leaves one E7 before the set is complete. Three more new routes in the big hills, (Death or Glory, TD/ED, 1000m with Matt Helliker in Peru, one in Nepal, Snotty’s Gully, ED+, WI5+, M5, 1000m, with Jon Bracey and Tentation, III/6, Point Lachenal, Mont Blanc Range, France, also with Bracey), and the discovery of the Llyn Peninsular, adventure in a crumbling paradise. Continuing to live this nomadic life is at times difficult, but dwindling savings and the rent of his home in Leicestershire, topped-up infrequently by the occasional article, lecture and photo still find him very keen. Since writing and re-writing the above intro, another three years have passed. Several expeditions – some successful, Chang Himal, some not so successful, Annapurna III – have been experienced, suffered, endured, enjoyed. The book is now in the hands of Ed Douglas and Vertibrate Publishing, http://dmmclimbing.com/news/2011/09/book-deal-for-nick-bullock/ and is near to publication. 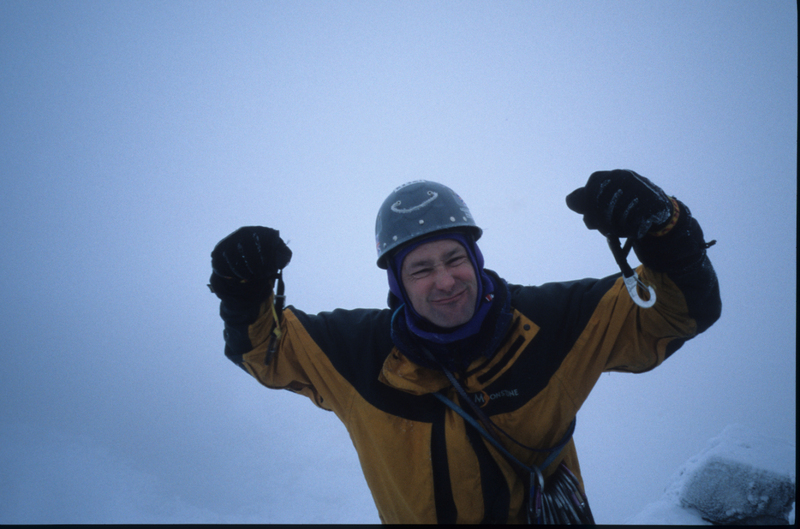 The rock climbing, Alpine climbing and winter climbing still give the rewards and excitement and thrill they always have. 2011 will hopefully be an exciting year with two expeditions planned, one to Kyashar and one to Jannu, both in Nepal. Between these expeditions Nick will no-doubt be climbing crumbling rock, and possibly some solid stuff in North Wales, Scotland and the South. After a winter spent in Britain climbing new routes in Wales and Scotland and repeating many other established climbs the Alps beckon and a return to the Alps for the winter of 2011/12 is on the cards. Nick can be contacted on nickbullock2003@yahoo.co.uk for anything that will make his bank manager panic a little less. BUT he is not a charity; his photo’s-writing and lectures are his only funding so please remember this before asking.